1.Cut a piece of Dovecraft pink A4 cardstock to 15cms wide, score at 3cm, 5cm, 7.5cm and 10cm each side. Concertina the sides. 2. With a craft knife and ruler make a slit along the 5cm score line on both sides leaving 1cm at the top and bottom of the score line. 3. Cut a piece of the Simply Creative Sugar Rush 6x6 paper to fit the centre of the card and adhere. 4. 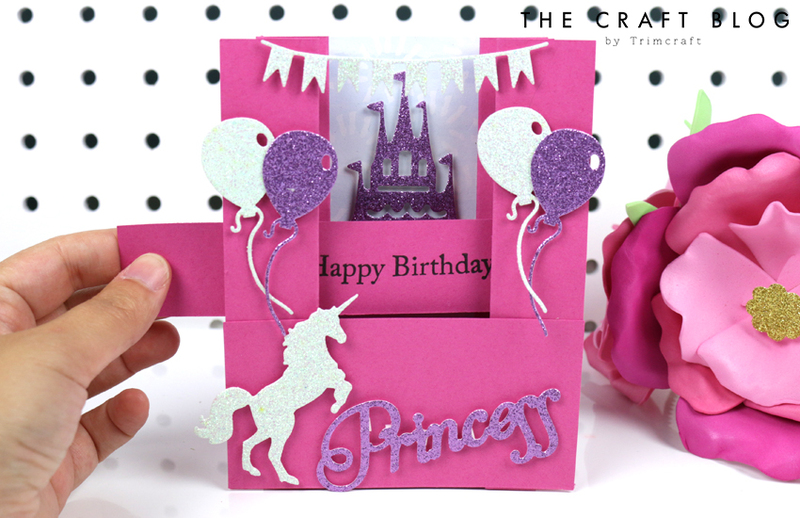 Die cut the Fairy castle and ‘Princess’ sentiment from the First Edition Princess dies set onto your chosen Dovecraft A4 glitter card. Adhere the castle to the centre of the Sugar Rush card, 6.5cm from the bottom of the card. 5. Cut a 12cm x 6cm piece of Dovecraft pink cardstock, adhere to the bottom front of the card with Dovecraft Perma Fix tape. 6. Die cut the balloons and bunting dies onto glitter card from the First Edition Party dies set. Adhere the remaining die cuts to the card. 7. Cut a 15cm x 3cm piece of cardstock, score at 1cm on one side. Stamp the words ‘Happy Birthday’ in the centre of the strip using the Dovecraft Wooden Alphabet stamps. Once dry, slide the secret sentiment into the opening. This card design would delight anyone who would receive it! This shape is fantastic to adapt for your chosen occasion, simply change up your papers and the sentiment and job’s a good’un! How will you use Maxine’s card shape? We’d love to see so don’t forget to #trimcraft when uploading to social media and to share your makes in the Inspiration area. This is sooo sweet, and just what will be perfect for my granddaughters birthday til November, as she loves both pink and Unicorns and fairies ha ha ha. She´s going to love this one, I´m sure. Love it! Inspired to make it!